June 24/25, 2017. Joe has advised that Yanqui has been sold and is on her way to the Seattle area. We'll standby for details and the new owner to check in. So we sold Yanqui last weekend to Stephen, who lives in Seattle. He's going to contact you independently. I sold the trailer to John, owner of a Lunn boat out in Maine. He'd been looking for a trailer to get his new boat out to the West Coast. (Webmaster Note: a little birdie told me that http://dolphin24.org/savili.html may be on her way to the west coast) For a three party deal, with a boat in one state, a buyer in another, and a trailer going to the third person, it all went remarkably well. I had Yanqui pulled out of the water by a travel lift and John and I drove her up to Seattle. We had a minor scare when the fully rigged boat didn't get even close to floating free on the boat ramp, but after some adventures in trailer tongue extensions (the trailer had one I'd never used) she splashed. The three of us motored her to her new home in Seattle. My father and I have parted ways with Yanqui with decidedly mixed feelings. The old saw that the best days of boat ownership are buying and selling have never been true for me, including with Yanqui. I dislike buying boats and I have regretted every one I've every sold. The joy, for me, is in improving them. I take satisfaction in having improved Yanqui's running rigging and sails immensely. And I am encouraged to have sold her to someone who I am confident will attend to those parts of her I didn't have time for. Thanks for such a fantastic site and all the work you do on it. At the rate I'm going, I'll be in the market for another Dolphin in about ten or fifteen years. June 26 postscript - minor edit .... it's hard to overstate how valuable a service you provide. 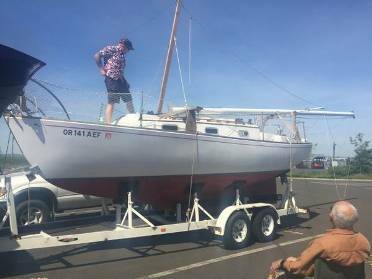 We're buying another Montgomery 17 (probably the size of boat we should have stuck with) and it's amusing how often I take for granted that there will be a website dedicated to it of the caliber of dolphin24.org. In particular, when I was inventorying all the things we've added to Yanqui, then comparing that to how much we could sell her for, it was initially a bit discouraging. As I looked around the website, though, I saw Yanqui as a living thing with a history. I'm certainly losing money as I pass her along (such is the nature of boats), but if the investment is in the boat as an ongoing example of a brilliant design, that's a return of its own. It's with really strong emotions that my dad and I have decided to part ways with Yanqui (Yankee 197). We realized this year that she was the perfect boat for a different period of our lives. Take care and enjoy the season. 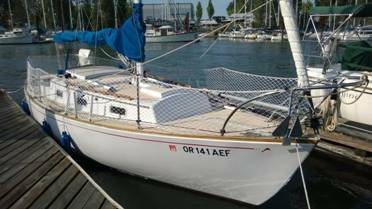 With great regret, we're selling our 1971 Yankee Dolphin 24, Yanqui. She's Yankee Yachts hull #197, one of the later boats from a 1959 classic plastic design by Sparkman and Stephens. Go to www.dolphin24.org for lots of information on the design. She's a small, trailerable, centerboard/shoal keel cruiser with classic lines from the era of boats made to race and cruise. It's an extremely capable design. She draws less than three feet with the board up. She points better with the board down, but in the river I almost never lower it and she sails great. She's small enough to pull out for the winter, big enough to bring friends, but with controls set up so that the skipper can still do all the sailing. Sleeps five, with a settee, forepeak, portapotty, sink with freshwater tank, electrical. Comes with a trailer in good condition, with surge brakes, good wiring, and good tires. She tows great behind our V8 Ford Explorer. Yanqui spent almost a decade in dry storage, then was sailed in the SF Bay half the year (inside storage the other half), then came to us. We made a lot of improvements to running rigging and deck hardware (see the list below). She needs absolutely nothing to sail today. Her needs are cosmetic. Her teak (mostly the toe rail) needs some love: stripping and varnishing, or just oiling. She has some river docking scars, none of which go deeper than her paint. Inside could use some care. She is extremely efficiently set up for singlehanding. If you leave the cockpit on this boat, it's because you want to. All lines are led to the cockpit via turning blocks, deck organizers, through rope clutches, past winches. All hardware well bedded. Truly all lines come back: vang, cunningham, outhaul, both halyards, both reefs. Most of the deck hardware (except winches) is Garhauer Marine. Very stout. 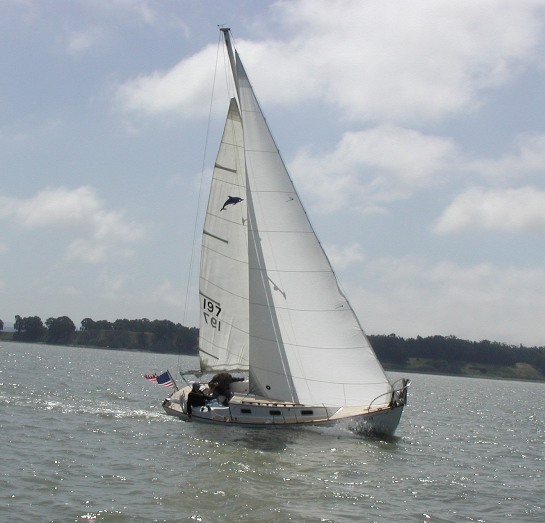 The genoa furler is a Harken unit capable of offshore work (has two tracks to allow one sail going up as the other goes down). Both sails are North Sail, measured and designed by them. 130% genoa is about four years old, double reef main is less than a year old. She has an annually serviced Suzuki 5 HP outboard. The boat is in the water right now at McCuddy's on the island. The trailer is at my home. Not interested in trades. Long distance is fine, but scams are easy to detect. If you're out of town, tell me a bit about your sailing so I know you're real. Photographs (below) don't all show the brand new mainsail. Wanted to let you know that my father, Arnold, and I are now the new owners of Rick's (Englar's) Yanqui. We bought her this afternoon and will be getting her up to Portland as soon as we can arrange it. We intend to keep her name. Thanks for your page, especially the For Sale section, of course. April 5, 2011. Arnold sent in the following update. Until we get a new photo of Yanqui with her new crew we'll use this picture Rick sent us. You probably wondered if YANQUI disappeared? Well, Joe and I got her trailed from Benicia to Oregon in late January. She presently sits on Her trailer nearby in Lebanon while we wait for spring to spring here in the Pacific NW. We have a slip reserved at McCuddy's on the Columbia and hope to have Her floating again late this month. We measured Her for a new furling headsail by North Sails and are anxious to go sailing. Question: The sliding hatch needs a little work but I am considering building a new hatch of wood much like we had on El Gitano.....you know, teak and all. If you know of any other Dolphin owners who have built a sliding hatch I would be anxious to hear from them before I start the project. Webmaster Note: Readers with any input on Joe and Arnold's question please post on the Forum http://dolphin24.org/forum/ or contact RonBreault@dolphin24.org. Rowland Thompson, Thistle, Yankee #99 has provided contact info for the wood parts supplier that Yankee used. Click here to go there. Yanqui is very close to hitting the water. She's in a yard on Hayden Island now, a stone's throw from the Columbia River. She's getting a Harken furler (assembled today), a 135% genoa from North Sail (being sewn at an undisclosed location in Southeast Asia as we speak), a rigid vang, rope clutches, cabin top winch, a new gooseneck, and the word "Portland" on her transom (just did that this afternoon). Having gone from a Cyclone dinghy, to a Guppy 13, through an O'Day 19, to a Montgomery 17, and now a Dolphin 24, I am most of all impressed by the steady rise in the price of a single block for each boat. The $5 used block that sufficed for most everything on the Guppy is now a $40 Garhauer block for the Dolphin. It's a story as old as the hills, but Yanqui has had a hard time competing with Lucy, our 18 month old. Or rather, to be fair, she's had a hard time competing with two working parents. Over the summer I got out as much as our six day a week schedule allowed. It's not all bad for Yanqui, though. Our plan had been to both work until retirement, then trade Yanqui for a Bristol Channel Cutter and sail away. Facing the realities of three kids and two jobs, though, we've decided something has to give and it's the second income that was going to make circumnavigating BCC possible. 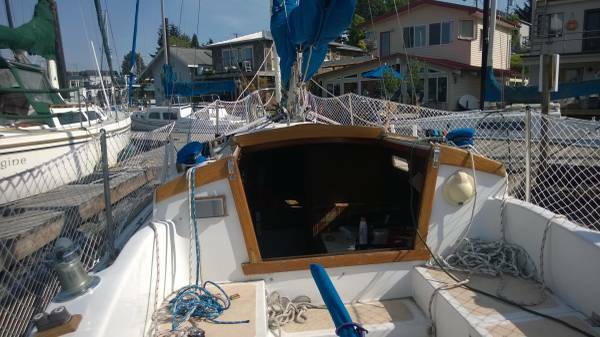 My wife is quitting next Fall and we'll have time to sail Yanqui with the kids, in preparation for our retirement circumnavigating the San Juan Islands in a Dolphin 24. The Dolphin is perfectly suited to such an adventure and I'm delighted to have chosen such a versatile boat. This last season we installed two banks of rope clutches, two cabin top winches and a very wide traveler. I also got to go up the mast and install some furling hardware I neglected to put on when the boat was on the hard. Which sucked. We pulled her for the season and I towed her for the first time, which was a shockingly easy experience. She has a fantastic trailer. When we launch in April or so I'll take photos. May 9, 2016. We got the following update from Joe (minor edits). Well, I was fortunate that I got Yanqui in the water when I did, because we got the last available slip at the marina we prefer. More importantly, though, a couple weeks ago I took a spill and managed to break a rib. Incredibly painful and not something to go sailing with. Coincidentally, though, the rib should be healed up about the time that we take delivery of a new mainsail. We got a quote from North Sails and from Precision Sails. The Precision quote was really good. Lots and lots of options and they were extremely responsive. We ultimately went with North Sail, because I’ve worked with the owner of the Portland location before and I like having him come out to measure up the boat. In the end, I guess I’m still hesitant about big purchases online or over the phone. We’ve gotten two sails from North already and loved both (headsails for Yanqui and our previous boat, a Montgomery 17). So for now, Yanqui’s update is a little sad. She sits in her slip waiting for my rib to heal up. Regarding the Dolphin model I was planning to make, I abandoned the effort. I got a decent hull form from the plans you sent, but the actual laying of fiberglass in something that small is really, really hard. In retrospect, I think a better plan would be to form the hull out of soft wood, epoxy it, then dig out the insides to lighten it and make room for the internals. I might yet try that, though the cost of the balsa wood involved is daunting. In the meantime, I’m building another boat from George Buehler’s book. They’re simple, single chine designs and so they’re relatively easy to make. Hope everything on the other side of the country is going well. Precision sent a very, very detailed pdf quote giving a lot of options based on three different sail qualities. They ranged from $642 to $1424. The guy from Precision immediately followed up, too. I felt bad not going with them because their price was fantastic and they were so responsive. North's quote was $1757. That's with two reef points and four battens. Of course, that's also with Kerry, the owner of the shop, coming out to the boat and measuring. 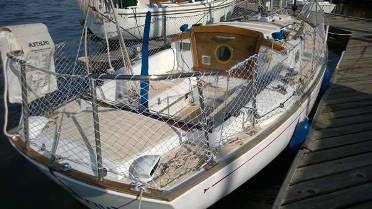 I have several boats and I'm not hesitant to use cheap sails. I bought sails for my Hartley TS-16 from an extremely cheap site called Intensity Sails and have been extremely happy with them. But I'm expecting to own this boat for a long time and don't mind the extra money for a matching set of North Sails. Webmaster Note: We've included Joe's comments re his new mainsail in our Technical Sections/Sails. Click here to go there. From this point on is the Yanqui story we have and pictures that Rick Englar sent us. On July 14, 2010. Rick checked in and advised he is selling his boat. This is a newly "Found Dolphin #159". Her homeport was Bonita Bahia, Benecia, California. 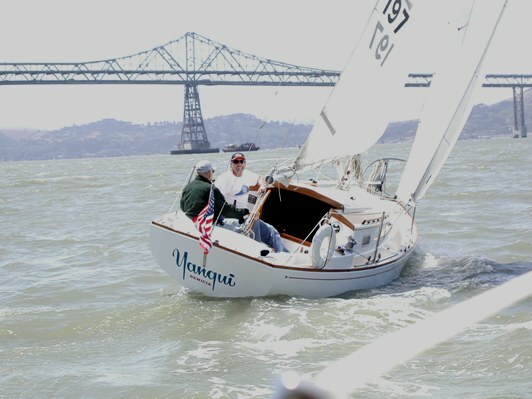 I purchased Yanqui in May, 2002 from Port Sonoma Marina. It had been donated to the Boy Scouts and been in covered storage the 12 years prior to my purchase. I spent months detailing her and sailed her June through October, stored in my barn the other months. She frequented SF Bay, San Pablo Bay, Delta, Napa, Petaluma and Benicia waters. It's my belief the boat has always been in local waters. I did not change her name with my ownership, bad luck. Thanks for her page and exposure, she looks too good to sell! Description: Sparkman and Stevens Design full keel center boarder w/ traditional lines. 6hp Suzuki 4-stroke in well, sink, icebox, stove, porta potti, compass, depth, sleeps 4 comfortably w/ Trailrite tandem axle trailer w/ launching tongue.